I'm revisiting a lot of my older pieces in my closet lately. This is due to the fact that I have felt like I've been ignoring the pieces I once was obsessed with. This peplum jacket/blazer does not get enough wear but I still enjoy having it in my closet (first seen on the blog here). Since I never nabbed the Tibi version, I take comfort in the fact that I have this cozy one. I also wore the heck out of my camo pants when I nabbed them on sale but put them away after I felt they were in the rotation too often. It's a never ending cycle. How often do you revisit older pieces in your closet? I feel like I don't revisit pieces nearly often enough - I really should make more of an effort! Love those camo pants, Nancy! 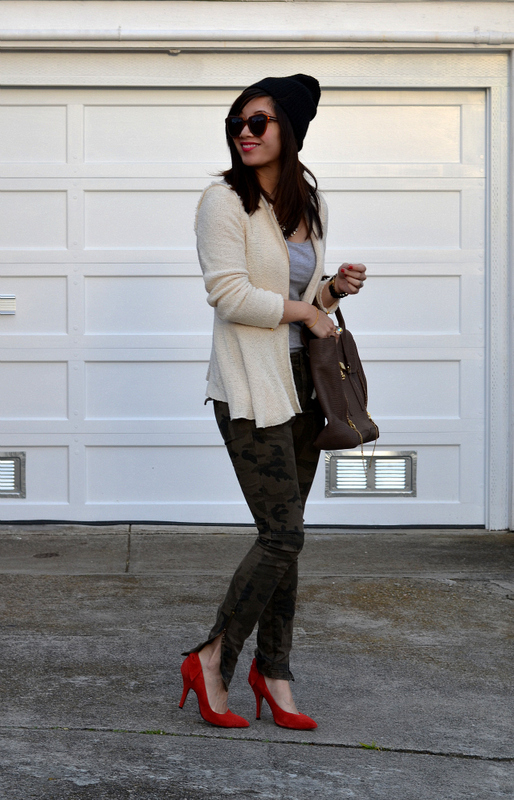 I'm loving the fun but classy way you styled camo pants! Gorgeous look! Great look! I love your shoes, great pop of color! These camo pants are always so fun on you - I've been loving that trend. Camo always seems like such an interesting neutral. I always love when you wear your camo jeans. I love that cardigan too! So pretty! Love your peplum cardigan! So pretty! I love this peplum jacket, it's so cute on you. And those sunnies are super cute! 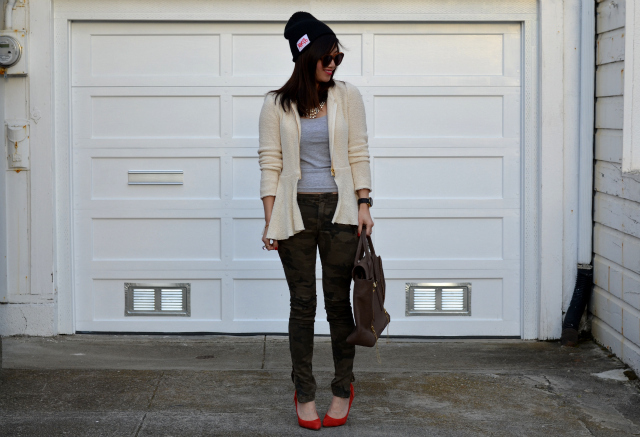 I love how you paired the camo skinnies with bright red shoes. I really love the punkie chicness of this outfit. Perfection. I seriously need to pay you to come raid my closet. You always look amazing. I make an effort to rotate through my older pieces so I wear them fairly often. It's not always easy, though! I love that jacket! Soo pretty. What a cute outfit! 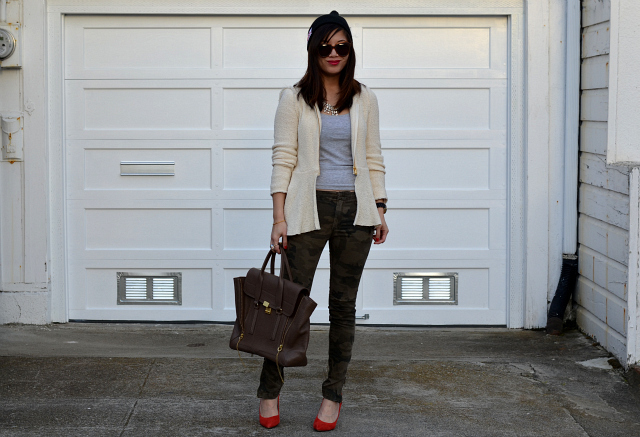 Love the camo pants - I have this love affair with printed jeans. Those pumps are just perfect! I adore camo pants. I've been looking for a pair for a while now, and love yours with those fabulous red heels!! Kiiiiiind of lusting over your tote! I try and keep my things in steady rotation. I have a professional organizer friend that suggested turning all the hooks of the hangers backwards and then when you wear something, turn it the right way when you put it back. And try not to repeat until you get all hangers turned around correctly. It's a little challenge, but it keeps things in steady rotation! i freaking love those pumps! you look so gorgeous- I love the red heels!! Love the jacket and camo pants! Plus the bright shoes look great with the neutral outfit! I browsed on your blog and I really love your style!! woud you like to follow each other? 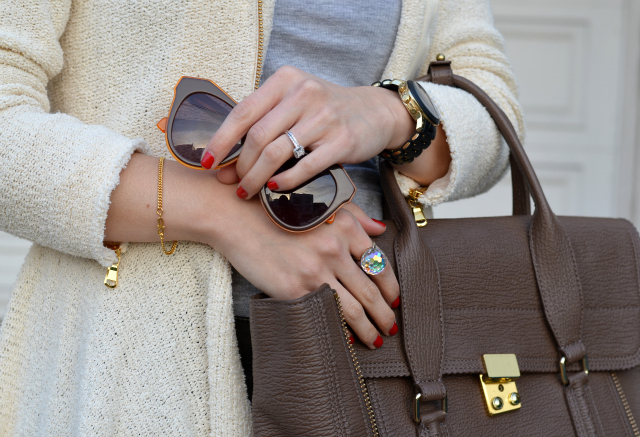 Especially the sunnies and bag. That pants are really great and I like that necklace too. Have a great day. the shoes! the pants! love! These red heels! Ahhhhhh, they're amazing! I'm also pulling old things out of my closet now that I gave up shopping for Lent! haha I have those pants too and I love them!! 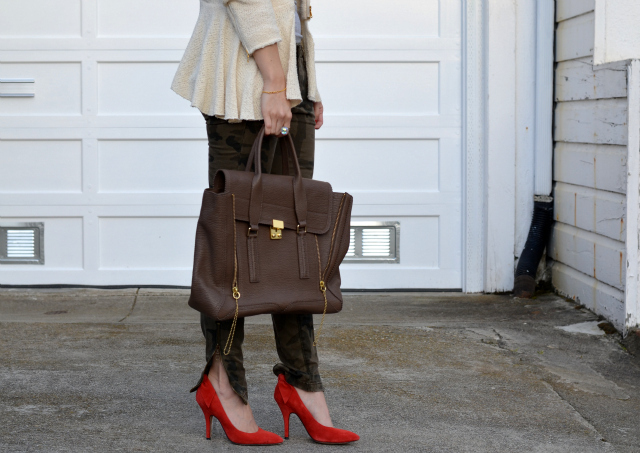 I LOVE this outfit - the pants are super cool and your bag is too stylish. I'm on my OE in the UK so as soon as I get back to my wardrobe in NZ (which is in storage) I'm going to go NUTS in there! Is it crazy to miss your clothes? I love this look! Camo print gone girly is definitely one of my favorite trends. The sunnies, the bag, the shoes....everything's soooo adorable!!! I love the red heels & pop of color. I dig those red heels!!!! And your pop of red on your nails!!!! Your style is so effortless and chic! Adore your site girl! !